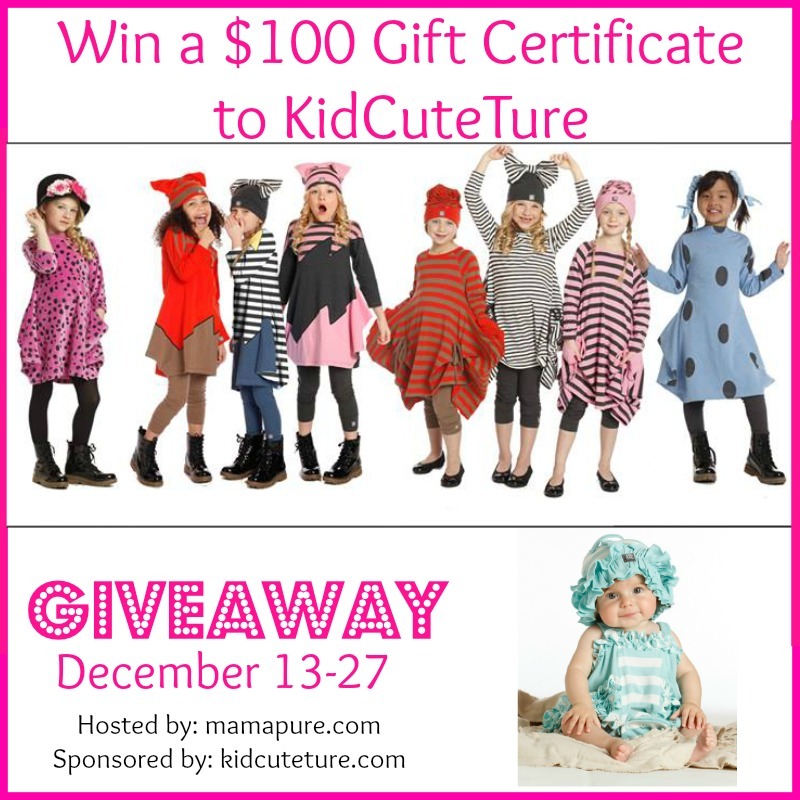 Welcome to the KidCuteTure $100 Gift Certificate Giveaway! KidCuteTure is a designer line of whimsical girls clothing brought to you from a mother-daughter team. Babies to age 14 years old can enjoy playful and sohpistocated ensembles that feature bright colors and unique cuts. To learn more about KidCuteTure read the full review over at mama pure. One lucky fan is going to win a $100 Gift Certificate to choose their choice of outfit for their favorite little girl. This giveaway is open to US residents, age 18 and older. Void where prohibited. Enter using the rafflecopter below. Winner will be contacted via email and has 48 hours to respond before a new winner is chosen. Prize fulfillment is the responsibility of KidCuteTure and not mama pure or other participating bloggers. Good Luck!!! Disclosure: I did not receive any compensation for this post. KidCuteTure is responsible for prize fulfillment and shipment. mama pure and other participating bloggers are not responsible for prize fulfillment or shipment. This giveaway is not associated with or endorsed by Facebook, Twitter, Pinterest, Instagram, or any other social media platform. If you have any questions regarding this giveaway please contact Laura at mama pure.